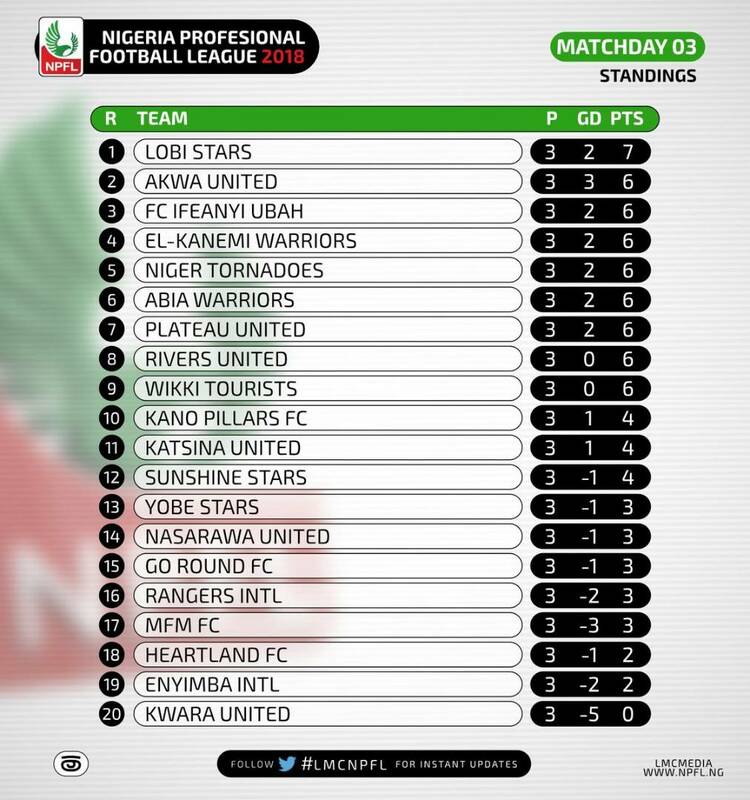 Lobi stars of Makurdi have maintained an unbeaten run in all their three matches in the NPFL thereby topping the table. The league table is getting stabilized as Kano Pillars and defending champions, Plateau United recorded their first loss in three games. Kano Pillars lost to away to Rivers United while Plateau United fell to Abia Warriors. As it is now, the league is just like it just started. Rangers International of Enugu had to do whatever it took to avoid the embarrassment of a three straight defeat in the 2018 NPFL by snatching an away win at Owerri against the Heartland FC. This first win is highly anticipated and it surely came in an outstanding style which was an away victory. Rangers International has the pedigree of a title contender considering their set of players, the coaching team led by Gbenga Ogunbote and the motivation coming from their sponsors. Godwin Obaje has found the net three times in three games and his team secured their second victory of the season as they condemned Kwara United to a third defeat of the season. The game ended with FC Ifeanyi Uba leading with two goals. These days are not the best of times for MFM FC as they fell away at Maiduguri to El-Kanemi Warriors by 3:1. All eye are on MFM to show consistency as they also prepare for the CAF champions league this year. Meanwhile El Kanemi warriors are proving that their consistency under Ladan Bosso was not a fluke afterall.